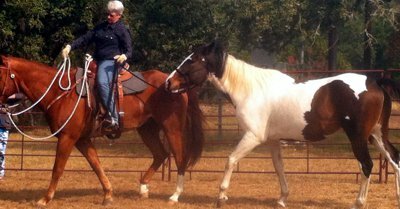 I paid good money for my horse, Remi, because I saw his potential but in reality he has been a rescue project from the start. When I bought him in the summer of 2007 he was a burned out roping and barrel horse. He had bucked off every previous owner and he was about as shut down as a horse can get. His feet were terrible and he had a tendency to tie up anytime he was ridden. Yet, I wanted him. I thought others might enjoy Remi's story and his rocky road back from being a rescue to being a happy horse. Below is a synopsis of his journey. If you want to read more in depth information, click on each of the links. Remi lived pretty much as a pet for the first few years as I worked to try and get his feet back in shape. He had serious thrush and his hoof walls crumbled but I so wanted to keep him barefoot. After several tough and painful years for Remi, I decided to put him back in shoes. His thrush was healed and his walls were healthy but he was simply not sound without shoes. Once back in shoes Remi was sound enough to take out to events and see if his mind could come around as well as his body. In Jan 2009 we headed out to a team sorting. We gained ground and Remi got braver. After trying Remi is plastic shoes I had to put him back in metal shoes. We went to another event but Remi had a bit of a setback emotionally. Not being one to give up I tried once again to get Remi barefoot. I found out something that Remi loved to do – swim. Gradually Remi got more consistent in his behavior. Boots helped but it was a constant battle to keep Remi sound. I discovered that on Magnesium Remi was much more relaxed and had less body tightness. I took Remi to a Tom Curtain clinic and he had a blast. Remi was still not sound without shoes and his sacrum was causing him major soreness. Time for major body work and back into shoes. Now, in the fall of 2012 I have a solid partner and sound horse. Remi is shod on all 4 with fill in pads up front. For now I have to accept this is what he needs to stay sound. I have him on a low starch, high fat diet and he gets chia seeds, di mag mallate and succeed for possible hind gut ulcers. He is feeling great and just worked wonderfully for me at the Extreme Cowgirl Rodeo. Even after I come off him from a hard spook he did not get upset. Check out how well he did in the team penning. I hope Remi’s story will be an inspiration to others with rescue horses who have physical and emotional challenges. 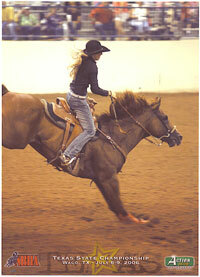 If a good horse is there it is worth taking the time and putting forth the energy to bring them back.